Well here it is my take on the expected, every blog and news source is doing it - Top 10 List. I looked at marketing efforts across TV, print, events, and digital to come up with ten U.S. marketing implementations that caught my eye. They did for a variety of reasons and yes I know the list isn't perfect and I could have added or removed some things in here. I also would've included more Ford, Lincoln and Mercury efforts but did not do so because I didn't want to come across as being too self-promoting, besides, others will certainly talk about some of the great stuff we did this past year; though, there was one marketing event I just couldn't avoid talking about. I had a hard time finding ten automotive marketing efforts that really stood out in 2009. A few efforts really standout while other ideas could exist in a Top 10 list or not. This set of banner ads from MINI during the month of October really impressed when few were able to capitalize on a particular holiday. In fact, many of the holiday ads right now are so uninspiring: red bows, snowflakes, and snow-caped mountains. Yawn. 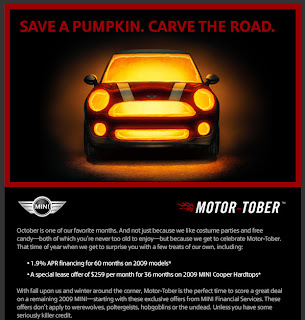 Last October MINI got it right by running several banner ads that played on the “face” of the MINI Cooper’s front fascia. Their campaign extended across mediums into TV, national radio and of course online. The ads show how an automotive company can have fun with holiday-focused campaigns while maintaining the brand’s integrity and spirit. If you are a regular reader of this blog, you’ll know that I’m a bit of a BMW fan. I’m honestly trying to stay as objective as possible and almost didn’t include this bit of copy-writing back-and-forth, but it caught the attention of a many online and even the New York Times. Audi ran a billboard in Southern California reading “Your move BMW” with an image of their very impressive A5 coupe. 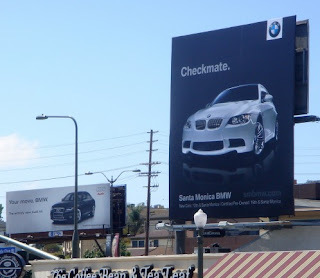 The local BMW dealership, Santa Monica BMW, retaliated by buying the billboard across the street reading “Checkmate” with an image of the new BMW M5 coupe. 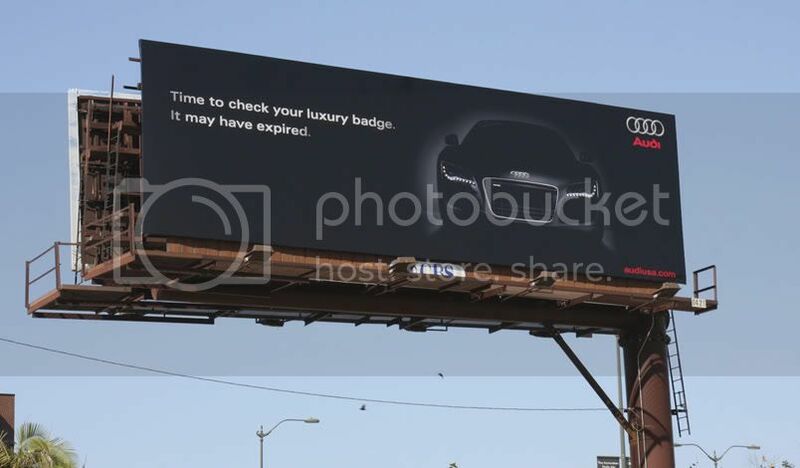 Audi soon answered back by changing their A5 billboard to a R8 with the lame less effective "Time to check your luxury badge. It may have expired" billboard, but by this time the joke was over and BMW had clearly won the copy-writer race. This is an approach similar to what GM is doing with their “May the Best Car Win” campaign and with the Buick LaCrosse campaign that is very openly challenging Lexus. I’ve heard several podcasts, read many articles, combed quite a few forums and what seems to be happening is that Honda and Toyota owners are all laughing at GM for making small 1 or 2 MPG wins over a competing Honda or Toyota model only to reinforce their current ownership decision because the real win is resell value and long-term quality. If anything, the GM spots are causing Honda and Toyota owners to mock the GM ads in similar fashion BMW mocked Audi. The Audi BMW billboard war was just a lot more fun and showed how something as simple as a few well-placed words on a billboard can be more viral than any overly thought out video or social media campaign. This is a fun ad campaign that incorporated the data from someone’s Facebook profile. It “illustrates the future of database-driven ‘smart ads,’” according to Rick Mathieson, the author of The On-Demand Brand. The application did some basic word matches to determine which Volkswagen would be best for the person’s data it was analyzing. 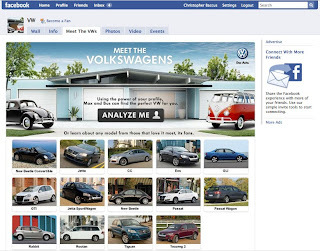 It was a simple, interesting way to connect a consumer with a VW product that they may not have considered. I think what was most interesting is that the application showcased how Facebook data could connect with a company’s products in a non-intrusive way. Unfortunately, the application never said why a Passat CC is right for me. But if I was going to buy a VW it was pretty spot-on, proving someone knew what to look for on my profile. Ken Block, a world-class rally racer, showcases his rally Subaru in this video which promotes his company DC Shoes partnered with Subaru for the Gymkhana Two Project. The British auto enthusiast show Top Gear even picked up the Ken Block buzz when they had Ken showcase his rally skills on a recent episode. This video is quite possibly the best cross-promotional marketing I’ve seen. It gets it right for Subaru, DC Shoes and Ken Block. What makes this effort so captivating is how seriously cool the stunt is and how it caught a significant buzz on the web. To date, the video has over 9 million views! Now that’s how viral video is done. Admittedly the video showcases the DC Shoes in the video’s beginning but it certainly demonstrates how uber cool a Subaru can be too. The best line in the Honda Insight campaign is “the Hybrid for everyone” line. It quickly separated the Insight from its costly competitor the Toyota Prius. Unfortunately, the product positioning statement in the ads didn’t give Honda the boost they needed. Most of this is due to a poor product, not poor marketing. The product couldn’t compete with the MPG King, the Toyota Prius. Plus the Insight suffered from too much of a me-too Prius design that was based on the outgoing model, making it look even more substandard once Toyota launched its much sleeker redesigned 2010 Prius. That said, the Insight’s marketing caught people’s interest with its below $20,000 pricing strategy and a marketing campaign that made the Insight look like a formidable candidate to take on its more expensive hybrid rival by showing hybids can be affordable, unfortunately Honda just was a much lesser car in what was becoming a crowded hybrid sedan market with the Ford Fusion Hybrid and the new Prius. An automotive brand hasn’t let a little creature define it’s product since the flop of “The Caddy that Zigs” when the Cadillac Catera TV ads featured Cindy Crawford and a talking duck. Fortunately, Kia avoided the pitfalls of cartoon animals and decided to go with head bopping Zhu-Zhu pets to go along with it’s “A New Way to Roll” campaign. The cute hamsters were an instant hit as many in the target consumer group, 20-somethings, enjoyed the hip hamsters. The latest iteration is seen in a Kia ad featuring the Forte Sedan, Forte Coupe and Soul that features one of the hamsters plastered to a showroom window. It looks like the brand is accepting its hamster-ness. The delicate line Kia must watch for in 2010 is not becoming only about hamsters. It could really go too far: newspaper-lined floors instead of floor mats anyone??? Social media was the buzz du jour in 2009 and it most likely will continue in 2010. One of the more intelligent integrations of social media, online media, and event marketing was this effort from Volvo during last spring’s New York Auto Show. Volvo was promoting the City Safety feature of its all-new XC60 SUV. City Safety automatically engages the brakes if the driver gets too close to the car in front. It’s a bit of a complicated, hard to understand feature that is best understood through real-life experience. To accomplish this for everyone who didn’t run right down to their Volvo dealer to try it out, Volvo decided to have people visiting the New York Auto Show experience it outside of the show’s convention center. Once someone tried it out, they could Tweet their experience giving instant feedback to the world. Volvo incorporated the comments in a live feed in a banner ad they ran on YouTube for that day. I’m certain that we will see a few other automotive companies emulate this integration as the auto show season kicks up here in 2010. If there is one ad that really captures where the automobile is in the mind of Millennials, it’s Nissan Cube’s Mobile Device TV spot. The ad features a car that does not move and merely acts as a connection device for connecting with one’s friends, music and lifestyle. Everything moves around the Cube. The wheels are stationary. It is not about driving, it’s about socializing. Nissan’s treatment of the car as more of a smart phone on wheels is quite interesting. It really says the car’s benefits to a person’s life is not horsepower, a growling exhaust note, or a sleek design. Nope. It’s quite the opposite here. Here the car is more about its connectivity to your life and how well all your gadgets interact with it. This is a drastic change in how a car is sold and I’m quite certain it won’t be the last. The most notable thing Hyundai did from a marketing decision was implement their Assurance program that said it would let buyers of a recently bought Hyundai return the car if they lost their job (a few easy to understand restrictions applied.) It was an idea born out of consumer research that found potential Hyundai buyers were apprehensive mostly due to their concerns of rising unemployment impacting them. So, Hyundai answered with this campaign that was further promoted during the Super Bowl in early 2009. The high-profile TV spot was a great way to get the word out and it kept Hyundai sales in the positive while most manufacturers were losing 20-30% year-over-year sales. General Motors and Ford both came back with their own versions of the Assurance program but by that time most in the industry were talking about the latest sales boosting craze – Cash for Clunkers that would define the summer months. Hyundai continued to launch all kinds of extensions of the Assurance program, adding $1.49 a gallon gas price for a full year and additional cash incentives. None of the other ideas caught as much attention as the original Assurance program, but that didn’t matter as consumers understood Hyundai had a safety net program for uneasy shoppers. The brands impressive results with great new products and timely marketing campaign kept one company in this industry from a negative year. I don’t usually add anything from Ford, Lincoln or Mercury to this blog, but I can’t ignore the Fiesta Movement and what it has added to the automotive marketing space in 2009. The Fiesta Movement is all about generating buzz, buzz, buzz! It did so by giving 100 “Fiesta Agents” a European model Fiesta for 6 months and letting the Agents document their fun with the car using YouTube, Twitter, Facebook, MySpace, basically across social media. Agents were chosen primarily for their social media influence and creativity. Why I think this is the #1 automotive marketing effort for 2009 is not about me praising my own client or marketing firm I work for; rather, this idea of letting influencers (whatever that means) experience cars in an unusual, very involved way is going to be the big idea for many campaigns to come. Rumor has it that Honda is already thinking about doing something similar with the Insight as is another undisclosed auto firm. The attention Ford has received from the Fiesta Movement is quite impressive and sure to be copied. It was a great way to get the word out about a product that was originally almost 18 months away from debuting on dealer lots. In fact, the awareness of the Fiesta is similar to Ford’s Edge CUV that has been in the market for several years. The only question remains is how will all the early buzz of the Fiesta Movement impact sales? Will people not see it as a new fresh car to buy after 18 months of promotion before launch or will the momentum continue as Ford intends as The Fiesta Movement Part II is underway right now? Either way the Fiesta Movement will probably be one of the few if any campaigns our industry will remember 5 years out from 2009 and that is mainly why I gave it the top spot in my list. To add to #4 (social media integration), I think an even cooler execution was the Nissan Leaf effort. While I think the vehicle itself is rather icky, the use of Twitter integration was pretty brilliant in that it was used to listen and answer questions, rather than to broadcast. Nissan sent me an email saying they were going to be in town, and I could RSVP to see the Leaf as a VIP. I went to the "Americana at Brand" in Glendale, CA to see the car. They gave away tee-shirts and stuff. Still you could not get a close look at the car or sit inside of it...not really VIP if you ask me. Several weeks later, Nissan didn't even show up to the LA Auto Show where the general public could have seen the Leaf. Fiestamovement incorporated social media and great user generated content as well as traditional marketing strategies. So, the question is: Did Nissan make a boo-boo by bailing on LA Auto Show, and focusing on other events? I would agree with you that Nissan should have been at the LA Auto Show. The only thing I would venture to guess is that the Fiesta stole the show and was the big reveal, so maybe Nissan has decided to make a big splash at another auto show where it isn't competing with another small car reveal. I do like their event marketing strategy of touring with the car and getting a lot people to the events; though, your experience of not feeling VIP is a downside of their heavy promotion. Perhaps in other markets where EVs aren't such a huge draw, the VIP feeling might be better. I definitely plan on attending the LEAF's visit in Detroit in January so I'll share that experience on here. Great information provided in the article which helps people to know some information. Implementing E-mail marketing policy in automotive marketing facilitates automotive dealers to directly get in touch with their possible customers, encourage business, and stay forward of competitors. This efforts are really good and helpful. It will be helpful for specially new firms.